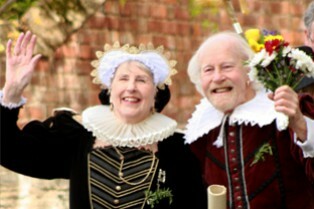 Thousands of people are expected to line the streets in Stratford-upon-Avon town centre to see the Shakespeare’s 450th Birthday Celebrations Procession which will leave the Great Garden of New Place in Chapel Lane at 10:30am on Saturday 26 April. The Band of the West Midlands Fire Service will lead the procession on its route down Chapel Lane, past the Royal Shakespeare Theatre, along Waterside, and into Bridge Street. Once everyone is in position, the ceremony of Handing Over The Quill will take place, flags will be unfurled, bugles will play, balloons will be released and the Band of the West Midlands Fire Service will lead everyone in singing Happy Birthday to the Bard. The many children taking part will follow the Band of the Air Training Corps as they are led to Holy Trinity Church by the Vicar, Patrick Taylor, making their way via High Street, Chapel Street, Church Street and Old Town. They will await the arrival of the main Procession which will end at Shakespeare’s grave by the altar of Holy Trinity Church where the Vicar and his assistants will receive the many flowers brought by people in the procession to commemorate and add colour to this auspicious and memorable celebration. The pilgrimage to Holy Trinity and the laying of flowers takes place whilst the Community Pageant gets in to full swing. The Pageant precedes the street entertainment and theatre workshops which take place throughout the afternoon. This is a free event and everyone is welcome to attend and enjoy.